We lost yet another wicket in the third over at the end of which we were 17 for the loss of 2 wickets. But little did JOSH knew, that their worst nightmare was walking in to play the innings of the Tournament; yes we are talking about the Xentian who picked up yet another Man of the Match Trophy (2nd Consecutive) Pravin Mandalkar. He began his innings with a Mighty 6 of the 2nd ball he faced and carried on the barrage with 8 such hits, over the next 6 overs. Unfortunately he fell when the Score was on 99 with a 80 run Partnership between him and Rishi M. Pravin scored 61 of 24 Balls (Monstrous) and was supported well by Rishi who scored 39 of 27 Balls. 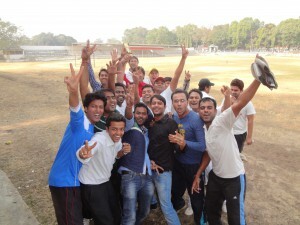 In the end the innings came to a halt with Xento Scoring 117 for the loss of 3 Wickets of the stipulated 12 overs. JOSH was happy to see the end of their blowing spell (at one point they almost wanted to walk away when the Might Wolves were on a rampage). Josh began their batting innings with only one option Hit the ball or let the bowlers hit your wicket; well that’s where team Xento is always a step ahead, our bowlers love to hear the sound of Timber when the ball hits the wicket. It was quite apparent as Mahavir K picked up an wicket in his second over and was supported well by Milind C and Kavishwar C. JOSH never stood a chance against the Mighty Xentians who restricted them to 61 runs for the loss of 8 wickets of the permitted 12 overs. We walked home with yet Another win !! Current Pool Standings Xento is 2nd in the League for Pool B with Symantec on top.